The main distinction from The Mentor is the Witch Doctor is not given respect. He's arcane, mysterious, and downright creepy even by the standards of his environment; That's why he lives well away from everyone else and doesn't wash much. His hut is filled with dried and pickled remains of unpleasant and unidentifiable critters. If he doesn't have explicitly magical powers, often the Witch Doctor is just a wetware version of the Mad Scientist. You go to him because he might have a better plan or advice than other rubes, but no one wants to actually talk to him. If he's smart, he knows it and will remind you frequently. Unlike the Mentors, he's concerned with your quest and possibly be a little fond of you, but perhaps not your particular survival. He is usually completely frank and your success is all he really seems to be rooting for. Even in recent times, most Witch Doctors have a semi-obvious ethnic derivation; the most tolerated currently is Jamaican/Caribbean (normally Haitian) and most will have a Voudoun slant. Interesting enough, the "surly wizard" stereotype may be the European equivalent to the Witch Doctor. A Witch Doctor can also be a villainous character, what with voodoo getting the treatment it usually gets in Hollywood. If that's the case, expect his general griminess to be played for creeps rather than laughs. Other times, they may be an example that Dark Is Not Evil. This is a Cyclic Trope, as it sometimes become unpopular to depict female European-style witches this way. One way around this is to have an updated, "modern" witch around as the main character, so old-fashioned witches comes off as cranky traditionalists. Then again, sometimes the "modern" witch turns out to be a poseur spouting the New Age equivalent of Techno Babble, and it's the traditionalist witches who know their stuff. Kururu from Keroro Gunsou may be considered a Mad Scientist version of the Witch Doctor. He's a creepy, sneaky Insufferable Genius who spends most of his time in his lab. And whenever he helps someone (even one of his squadmates), there's almost always a catch. Mama Odie from The Princess and the Frog, though she's more of a Bunny Ears Lawyer. The Wizard from Conan the Barbarian is a perfect example of this: he is Asian rather than the usual Jamaican/Caribbean, but he wears clothes made of seaweed and he seems quite mad. He turns out to know his stuff, however. Tia Dalma, first seen in Pirates of the Caribbean : Dead Man's Chest seems to be the living incarnation of this trope—her little hut has the fixings for everything, from rum to music boxes to human souls. Azura, the creepy old witch in Eve's Bayou. She has some bad blood with Mozelle (herself a more personable version of this trope), though it's never revealed why. The Discworld novels play with this. Many traditional witches and wizards deliberately cultivate an intimidatingly occult image because it's what people expect. Thus, witches wear pointy hats and black dresses and work with exotic herbs and improvised tools of magic, while wizards wear pointy hats and colorful robes, wield staves, and have a lab with occult books, dribbly candles mounted on old human skulls, and a stuffed alligator hanging from the ceiling. Much to the chagrin of many younger witches (who act more like stereotypical neo-pagans) and younger wizards (who act more like quantum physics students), the older wizards and witches do get respect. Charmed had once had a witch doctor who is neutral who specializes in exorcising angry spirits. He's also Genre Savvy enough to lampshade the fact that he appears to be a normal guy in a suit: "You were expecting a guy with a bone through his nose, right?" Law and Order: Criminal Intent featured a woman who claims herself to be a healer and uses tricks and chemicals to scare and scam the sick. This episode also featured a good voodoo healer who explains that all religions have good and bad people who practice it and claim that the scam artist just uses tricks and no magic. Dr. Bombay on Bewitched is both a Witch Doctor and a doctor for witches. Unlike the usual stereotype he is white and British. The Addams Family, on the other hand, have as their family doctor Dr. Mbogo Mbogo, whose office is in the bush in Africa. In the Reunion Show Halloween with the New Addams Family, it is revealed that the now-grown Pugsley attended Nairobi Medical School and has become a witch doctor himself. Played heavily by Screamin Jay Hawkins when singing "I Put a Spell on You". In 1974, during a World Cup qualifier in Rhodesia (now Zimbabwe), the Australian soccer team got a local witch-doctor to curse the opposition, but couldn't produce the money when he demanded payment, causing him to switch the curse to the Australian team. The curse was used as ann "explanation" for Australia's failure to qualify for subsequent World Cups, most notably 1998, when Australia was leading Iran 2-0 late in the final qualifying game (after tying the first game 1-1), only for Iran to score two late goals and qualify on away goals. In 2003, Australian television personality John Safran paid another witch doctor to remove the curse, and Australia then qualified for the 2006 and 2010 World Cups. 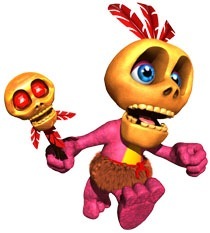 Mumbo Jumbo and Humba Wumba from Banjo-Kazooie. The former (current page image) handled transforming the main characters into various creatures such as termites, alligators and even pumpkins in the first game. In the sequel, he was actually playable and used different spells to interact with the overworld, while Humba Wumba took over the transformation business. The Trolls of the Warcraft games have plenty of Voodoo Witch Doctors, complete with Jamaican accent, mon. They run the gamut from Dark Is Not Evil good guy types like Sen'jin, and Complete Monsters like Zalazane. Houngan, from the Clayfighter series. One of the new classes in Diablo III is the Witch Doctor, which appears to be quite similar to the Necromancer in Diablo II, who also have many similarities to witch doctors. Defense of the Ancients All Stars and its remake has a hero called Witch doctor. Uncle from Jackie Chan Adventures specializes in Chi spells. The Big Bad from The Princess and the Frog is this mixed with Francois "Papa Doc" Duvalier, who was something of a real witch doctor on top of being a horrifying dictator. Found in an episode of Scooby Doo Where Are You? The witch doctor in question is, of course, fake. Zecora the zebra from My Little Pony Friendship Is Magic is not at all bad, once you realize Pinkie pie exaggerated just a tad. The witch doctor in the original George of the Jungle looked and dressed the same as a traditional Western doctor, partly to avoid Unfortunate Implications and also because of Rule of Funny. The remake had a more traditional witch doctor as a foil for Ursula's father, a modern doctor. This page was last edited on 7 November 2017, at 14:04.